I love salmon. Sometimes I’ll just lightly coat it with olive oil and a little salt and pepper while other times I’ll get more creative. This glaze is robust and flavorful and pairs wonderfully with salmon (I’ve also used this marinade on chicken and pork and it’s just as yummy). 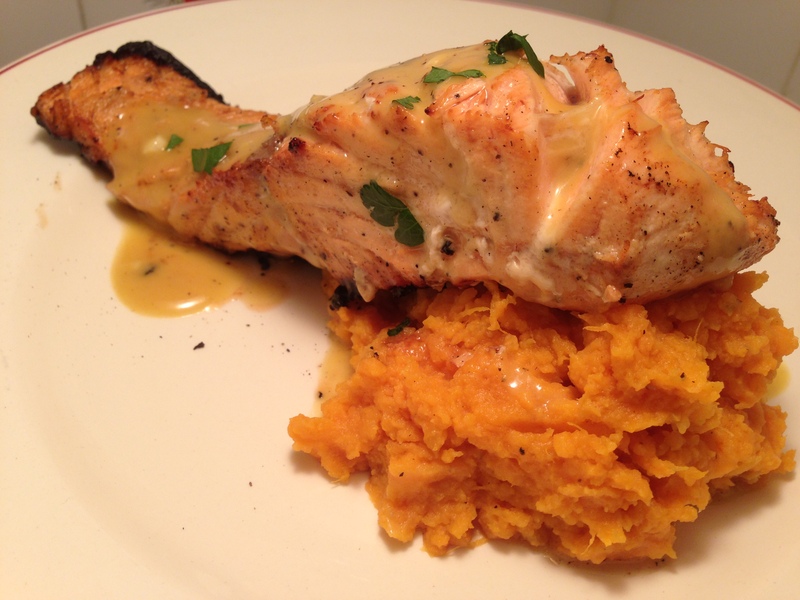 I prefer salmon on the grill, but it’s also far less messy and equally satisfying when baked. While I break out the grill pan for this recipe, you can just as easily make it without one. I’ll show you how. Begin by making the marinade. 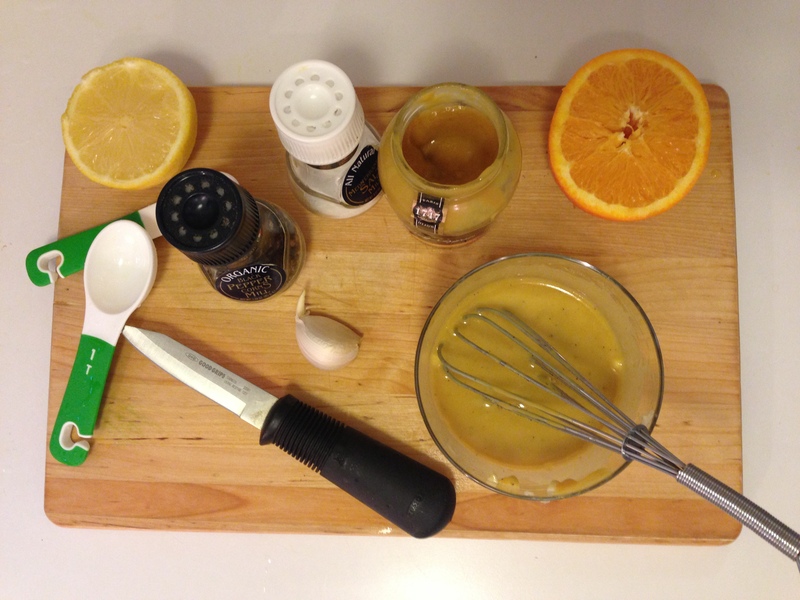 In a small bowl, whisk together the honey Dijon mustard with the lemon juice, orange juice, olive oil, half a clove of garlic (minced), and salt and pepper. 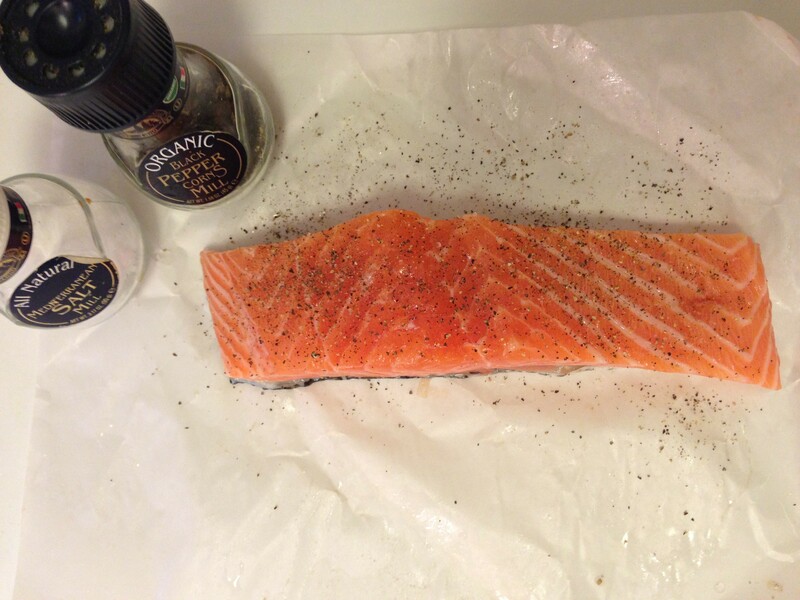 Season your salmon with salt and pepper, and pour half the marinade over the fish. Save the other half to pour over the fish after it’s cooked. 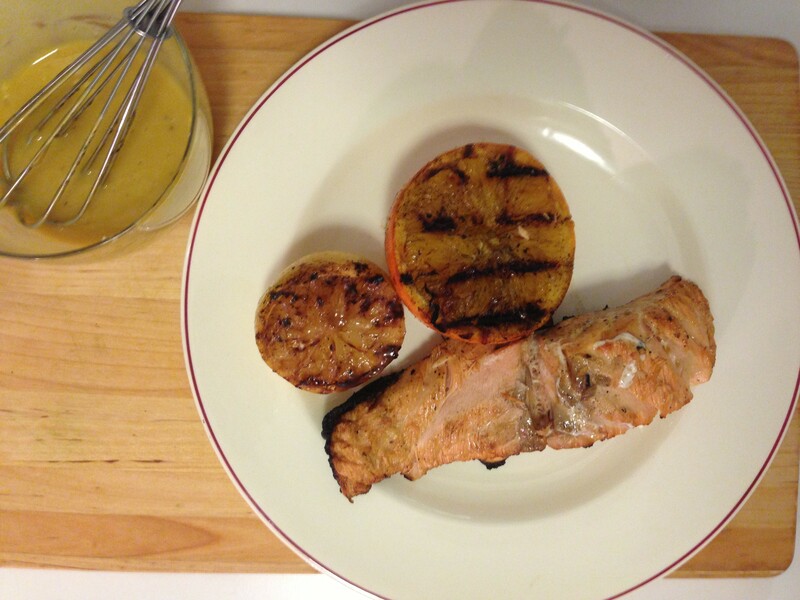 I typically put the salmon in a Ziploc bag and pour the marinade into it. 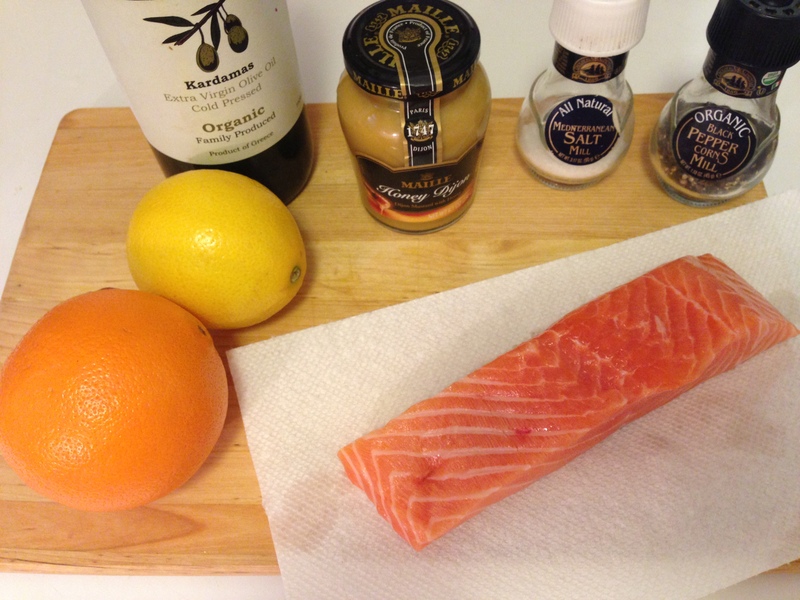 Let the salmon marinate for at least 15 minutes. Heat your grill pan on the stove with the burners on medium high heat. If you don’t have a grill pan, no problem. You can opt to pan sear it or bake it. I warn you, baking is the cleanest and easiest method. If you choose to pan fry, place a few tablespoons of olive oil over medium high heat and let the oil heat up for a few minutes (this is the key to a perfect sear). 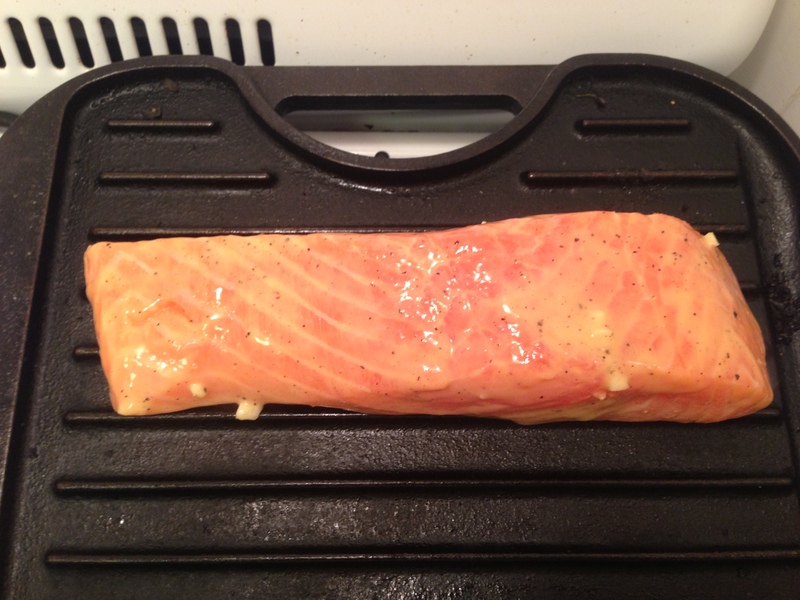 Place the salmon in the pan, skin-side down. Let it cook for 3-5 minutes before carefully flipping it with a spatula for 3-5 minutes more. If you prefer to bake your fish, place your salmon on a sheet tray and into a preheated 450 degree F oven for about 10-12 minutes. No flipping required. Now back to my grill pan. I like to add half an orange and half a lemon face down on the grill pan to get charred. This is, of course, optional. After the salmon has been cooked, let it rest under tinfoil for about 5 minutes. I like to use this time to squeeze a few more teaspoons of my orange and lemon halves on the fish. Finally, pour the remaining sauce over the cooked salmon. Now it’s time to eat! I pair salmon with a variety of things. It’s pictured below over mashed sweet potatoes. 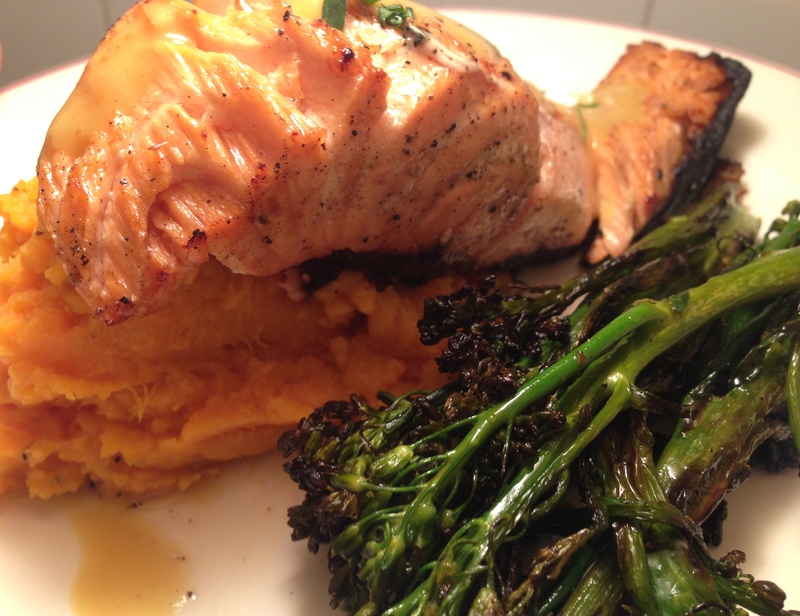 And try pairing it with my Charred Broccolini! Fieldhouse Fun Fact: Whenever I cook fish or anything that smells, I like to simmer a small pot of water with cinnamon on the stove. It’s the perfect solution for getting rid of unwanted odors in a small studio apartment! I’ve also found baking to be the least invasive method for preparing “odorless” seafood, especially when it’s marinated. I can’t wait to try this!!! Looks amazing.